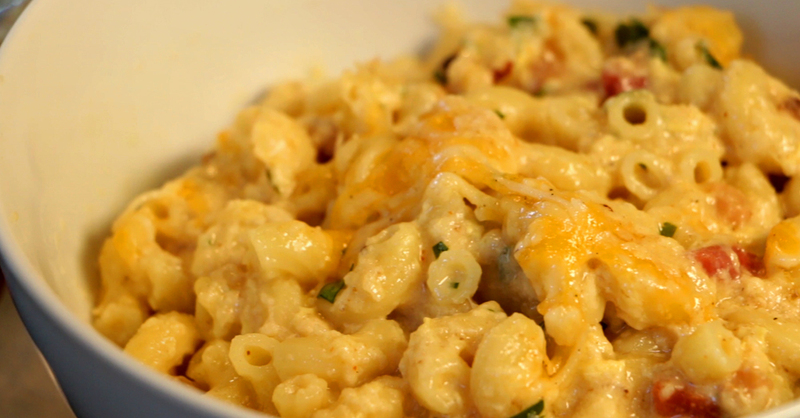 We’re no strangers to cheesy pasta bakes, but this stuff… it seriously rocked our world! Inspired by traditional carbonara sauce, these noodles are loaded up with tons of creamy, cheesy goodness, a liberal dose of pancetta, and a little bit of pepper to cut through all the delicious richness. This is comfort food at it’s finest! We typically make this for weekend dinners, but it can be easily made in advance, so all you have to do is pop it in the oven at the end of a long day. Either way, we know dinner is bound to be amazing when this is on the menu! Preheat oven to 350º Fahrenheit, and grease a large casserole dish with nonstick spray. Cook noodles according to package directions, or until al dente. Drain and set aside in a large mixing bowl. Add olive oil to a deep skillet (or large pot) over medium heat. Once heated, add pancetta and cook thoroughly. Transfer pancetta to a paper towel-lined plate, leaving grease in skillet. Add garlic to skillet, and saute 1-2 minutes. Whisk in flour until completely dissolved, followed by warm milk. Stirring constantly, increase heat to medium-high and cook about 5 minutes, or until sauce has thickened. Reduce heat to low, and add thyme, cayenne, salt, pepper, and all grated cheeses. Stir until all cheese has melted and is thoroughly incorporated. Remove from burner and pour into bowl of macaroni noodles. Add pancetta and thyme to mixture and stir to combine. Transfer to baking dish, top with desired amount of extra cheese, and bake for 12-15 minutes, or until cheese topping is melted and top is golden. Remove from oven and let rest about 10 minutes. Serve warm and enjoy!